Health and Wealth and a Book(s) section. I had always wanted to write a children’s book, but was always too busy in one way or another. Plus I just didn’t have the health do everything I wanted to do. I often mentioned that we need to stay still or meditate in my Masterkeys’ blogs. We need to recognize when life/universe/God is trying to nudge us in the direction our lives should truly take. I talked about my journey through cancer in my Health and Wealth blog, (read more) . At that time I couldn’t sleep very well from the fear of death and because I also I had to sit more during that time, my stillness let me hear the message of my heart. 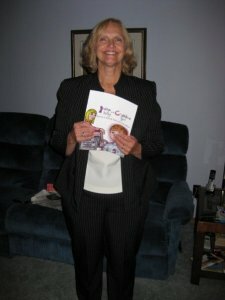 So, I started to take the steps to write and publish a children’s book. I had been questioning why I kept hearing about the number of children with autism increasing yearly. I had heard laughing was good to help your odds of recovery from cancer by reducing your stress. 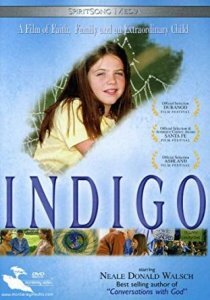 So, one day when I was in a video store looking for a funny video, I was drawn to a movie called ‘Indigo’ (more about movie). One of the actors in it was Neale Donald Walsch author of “Conversations with God”. A special feature on the DVD explained that the children in the film did exist. The movie people were trying to let the parents and these children know that they were just more evolved people. They were born to help the world with kindness. More importantly, so many kids are being diagnosed and medicated because they don’t meet the normal standards that I knew this was what I had to write about. If I wrote a superhero type story listing some of the Indigo powers, maybe some of these families would feel better about themselves. Maybe I could help the parents realize the possibility that they had very special caring children in their lives instead of feeling there was something wrong with them. I wanted to make them open to the possibility that their children were not broken. That maybe they didn’t need to be fixed with medications. Do you have a hard time believing that children/people are still evolving, possibly to the levels of Indigo and Crystalline children? Then , ask yourself, “what year did we stop evolving, 1918, 1953”? 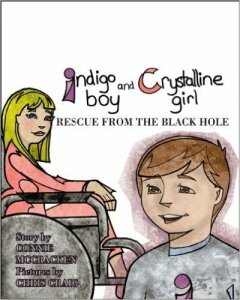 Indigo Boy and Crystalline Girl were created!! I had to learn a lot about publishing and self-publishing. During the process the Canadian self publishing company I decided on was taken over by an American company. So, I was afraid it would never get published. Luckily all worked out. I was fortunate in publicizing my book with local TV and newspapers. Because I had been in ‘public relations’ with a factory in my city, I was lucky to know some of the local media. Also my friends and relatives supported my book launch amazingly. Thanks to a local bookstore, I had a great launch party and went on to read my book in several libraries nearby. Then life changed and I was drawn in other directions. However, many kind people asked when the next Indigo story would come out. But it is almost nine years later that universe is nudging me to write again. Circumstances keep coming up to set me on the path to getting the second story in the Indigo series published. Here’s hoping it won’t be long! I appreciate very much the support of all those who think there should be another book. Fortunately my illustrator, Chris Craig, wants to work on another book with me! Most importantly, I also thank my family for listening to new ideas and helping with proof reading. Wishing all who have a dream to do something they have always wanted to do in life – to go for it! So sweet of you Wendy, I do so appreciate seeing all of your comments and likes on my posts. Thanks a big bunch!! Love the support to do another/more books!!! Well Connie we all know the next in the Indigo Series will be as awesome as the first. Your talent of writing has been long overdue. You know there is always a librarian here that will promote your books with great love and enthusiasm as will I. Love to have you do a reading here in Wilber-town. How to get your prospects to say yes 90% of the time. Le﻿arn what to do and 'word for word' what to say to build your team fast!